Holy Cross Seminary opens its doors to lay people from the world during the seminarians' vacation time in order to preach the Exercises of St. Ignatius. The form of the Ignatian retreat used is the five day retreat, since this length is sufficient for a profound conversion and transformation of soul, and within the possibility of most people living in the world, who truly desire their sanctification. Download the retreat application form. Fill out the form and return it to the Seminary. Only pay the $50 non-refundable deposit when requested to do so. This deposit is necessary to ensure the firm intention of the applicant to attend the retreat. Payment may be made by cheque or bank transfer into the Seminary's General Fund. The completed application may be posted to the Seminary or scanned and then emailed to us. Download the driving directions if you need them. Why the Exercises of St Ignatius? For as the reputation of the Exercises increased, it is wonderful how retreat houses were multiplied. They were like oases in the desert of this life where the faithful of both sexes might be refreshed with spiritual food…Let those be an example who have come to these places, whether they were drawn by the dream of higher and holier perfection or whether they were tired of being tossed by the world’s tempests, or whether disturbed by the world’s anxieties or disillusioned by its deceits, or embittered by its rationalism, or smeared with its sensuality. Whatever the cause, they have come to these places for quiet, repose and the reconstruction of their lives." It is just such an oasis from the world that Holy Cross Seminary desires to be for the laity when they come here on retreat. Pope Pius XI goes on to explain what it is about the Exercises of St Ignatius, whom he calls “the specialist of the Exercises”, which makes them invaluable, incomparable, and so powerful for touching souls. He explains that from the day that it was first approved by Pope Paul III the book of the exercises “almost instantly established and imposed itself as the wisest and most universal code for the government of souls, as the inexhaustible source of deep and solid piety, as an irresistible stimulus and secure guide to conversion and to the highest spirituality and perfection”. He further explains that the method of St Ignatius is “the most commendable and the most effective” on account of “the solidity of spiritual teaching, far from the dangers and illusions of the pseudo-mystics, the marvelous adaptation to every class and condition of persons…, the organic unity of its parts, the remarkable order in which the truths to be meditated are succeeded by spiritual instructions suitable to lead a man from the point where he is freed from sin to the most sublime peaks of spirituality, by the road of abnegation and victory over passion”. The question is consequently not why the Exercises of St Ignatius are preached at Holy Cross Seminary, but why they should not be. There is no such reason, and the zeal for souls of the priests, brothers and seminarians is manifested by their desire to share their treasure with the lay people by inviting them to share the Seminary during the vacation times. What are Ignatian Retreats like? Ignatian retreats are done in complete silence. Spiritual reading is listened to at meal times. During the day there are a series of conferences, and 30 minute meditations, as well as Mass, the Way of the Cross, the Rosary and Benediction of the Blessed Sacrament. The retreatants have the opportunity to see one of the retreat masters every day to obtain the spiritual direction that they need to help out with their meditations and with decisions that they may have to make. Opportunity is given for a good fervent general confession, as well as time to prepare it appropriately. All those who attend the retreats are taught to meditate as the retreat goes along. Who can do an Ignatian Retreat? Anybody who has the desire to know, love and serve God alone, and who is truly sincere in seeking God, can do a retreat. Some retreatants have never done a retreat before. Others have done several. A retreatant does not necessarily have to be traditional or even Catholic for that matter. He simply has to yearn to seek God and to have the sincerity and docility of soul to follow the method accurately. For the success of the Exercises of St Ignatius depend upon exact fidelity to the method passed on to St Ignatius by the Blessed Mother herself. January 2013: Fr. Christopher Curtis (left) and Fr. 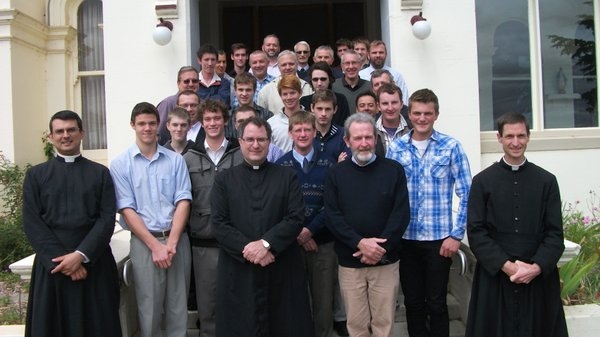 Paul Robinson (right) with the 30 attendees of the Mens'Ignatian Retreat, including Fr. Jules Bélisle.